An introduction to treaties in BC and Canada, and Métis settlements. Self-guided tour of relevant, quality, up-to-date online resources covering important areas of international law. Identifies sources for the text of treaties, focusing on treaties and agreements to which the U.S. is a party. Resources for researching federal Indian law (the relationship between the federal government and Indian tribes) and tribal law (the internal law of Indian tribes). Most, but not all, of British Columbia is on unceded territory. This means that the majority of Indigenous peoples in BC never gave up their lands through treaty, war, or surrender. UBC is located on the traditional, ancestral, and unceded territory of the xʷməθkʷəy̓əm (Musqueam) people. Click here for their community page. Click here for information on UBC and Musqueam history. Land acknowledgements are common at UBC; click here for more information. Vancouver and surrounding areas are also on the unceded territory of the Musqueam, Squamish, and Tsleil-Waututh First Nations. Click here for a newspaper article on the City of Vancouver's official acknowledgment of the unceded Indigenous territories on which the city sits. "From the eighteenth to the early twentieth centuries, Crown representatives and leaders of Aboriginal communities signed treaties throughout most of Canada in an effort to resolve issues of outstanding Aboriginal title. [...] Crown representatives interpreted these treaties as a “blanket extinguishment” of Aboriginal title. However, many have argued that at the time the treaties were negotiated, Aboriginal signatories did not understand the treaties as limiting or extinguishing their title." (From Indigenous Foundations). Information about treaties, the Indian Act, land rights, natural resources, and more. Brief overview of historical events, which provide context for understanding current legal and treaty topics (in PowerPoint presentation format). Early treaty-making from an Indigenous perspective. Brief history of treaty-making, including Historic Treaties (the Douglas Treaties), the Nisga’a Treaty, and the BC treaty process. Traces the history of treaty-making from 1534 to the present (published April 2010). Includes an essay; an online database with copies of treaties, surrenders, and related land agreements; and a gallery of nine digitized volumes from 1680 seigneurial grant dated May 29, 1680 to western Treaty 6 signed in 1876. Written by Gretchen Albers. Published June 6, 2011. Written by Anthony J. Hall. Published June 6, 2011. Section 35 recognizes and affirms Aboriginal treaty rights in Canada. Information on Section 35, supplementary resources, and recommended reading. First Nations, historians, lawyers, and judges interpret treaties differently. Well before the arrival of Europeans, Indigenous nations had already established treaties and treaty processes. One example is the Great Law of Peace established between five different nations. An in-depth history of the relationship between the Indian Department, later renamed Department of Indian and Northern Affairs, and soon to be dissolved into 1) Crown-Indigenous Relations and Northern Affairs and 2) Indigenous Services Canada and First Nations. Part 5 of this book (published in 2016) is titled "Land, Learning, Law, and Treaties". It contains foundational information as well as an extensive resource list for more in depth research. In particular, see the notes for Chapter 27. Note: Print copies are also available at various UBC Library and Vancouver Public Library branches. 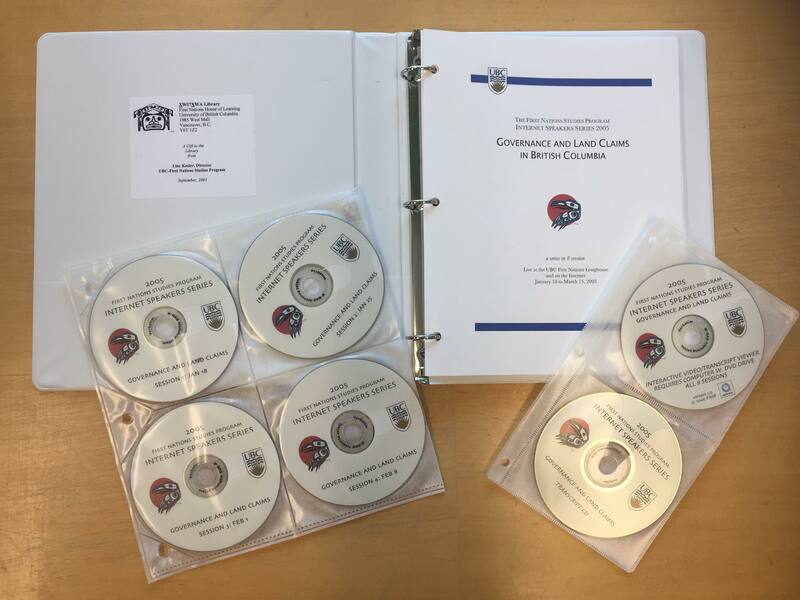 Lorna June McCue's thesis from 1998 is available through UBC Open Collections. IMPORTANT: Many of the links provided are from Indigenous and Northern Affairs Canada (INAC). In August of 2017, the government announced INAC would be dissolved into Crown-Indigenous Relations and Northern Affairs Canada and Indigenous Services Canada. If any of the links do not work, please notify Xwi7xwa Library and we will fix them as soon as possible. Online copy of Justin Trudeau's Indigenous Rights, Recognition and Implementation Framework. Published February 14, 2018. Comprehensive analysis of the meaning and trajectory of Prime Minister Justin Trudeau's Recognition and Implementation of Rights Framework. "Our report finds that the Rights Framework expresses a clear and coherent set of goals, which revolve around domesticating Indigenous self-determination within Canadian Confederation. These goals have been ordered into legislation and policy in a manner that guides First Nations towards a narrow model of 'self-government' outside of the Indian Act." Published August 28, 2017 by APTN National News. "This report describes the co-development journey taken by officials from the Assembly of First Nations (AFN) and Indigenous Services (IS) over the past 17 months under the Memorandum of Understanding (MOU) signed in July 2016." Responsibilities include: Status, Treaties, National Inquiry into Missing and Murdered Indigenous Women (MMIW), and the Truth and Reconciliation Commission (TRC). Responsibilities include: Health, Education, Housing, Water, Social Programming, and Infrastructure. Up-to-date records relating to the status of treaties in Canada. Negotiates and implements land claims and self-government agreements on behalf of the Government of Canada. Information on Treaties of Peace and Neutrality (1701-1760), Peace and Friendship Treaties (1725-1779), Upper Canada Land Surrenders and the Williams Treaties (1781-1862/1923), Robinson Treaties and Douglas Treaties (1850-1854), The Numbered Treaties (1871-1921). Historical interpretations and research reports on treaties. Treaty transcripts from mid 1700's to the early 1900's. Leads the BC Government in pursuing reconciliation with the First Nations and Indigenous peoples of British Columbia. Facilitation and coordination of national and regional discussions and dialogue, advocacy efforts and campaigns, legal and policy analysis, communicating with governments, including facilitating relationship building between First Nations and the Crown as well as public and private sectors and general public. Independent body responsible for facilitating treaty negotiations among First Nations in BC and the governments of Canada and BC. Comprised of a majority of First Nations and Tribal Councils in British Columbia. Provides a forum for BC First Nations to address issues related to treaty negotiations as well as other issues of common concern. Represents Inuit, Aboriginal, and Métis people and ensures that comprehensive land claims (modern treaties) and associated self-government agreements are respected, honored and fully implemented. Organized as a representative congress of American Indians and Alaska Natives that serves to develop consensus on national priority issues that impact tribal sovereignty. "Outside of First Nation political organizations, activists, or academics, there is no national entity bringing an evidence-based, non-partisan, and community-first perspectives to the discussions. This is a glaring absence in First Nations ability to organize and mobilize to protect their rights and jurisdiction. The Yellowhead Institute aims to address this gap." What is the Declaration on the Rights of Indigenous Peoples? What rights are ensured by the Declaration? Online copy of the Declaration (in PDF format). "Canada has committed to a renewed, nation-to-nation relationship with Indigenous peoples based on recognition of rights, respect, co-operation and partnership, and rooted in the principles of the UNDRIP." "Since 1794, Aboriginal Peoples have been guaranteed the right to trade and travel between the United States and Canada, which was then a territory of Great Britain. This right is recognized in Article III of the Jay Treaty, also known as the Treaty of Amity, Commerce and Navigation of 1794 and subsequent laws that stem from the Jay Treaty." (From Pine Tree Legal Assistance). Online text of the Jay Treaty (November 19, 1794). Includes background information, frequently asked questions, and legal resources. Facts about the Jay Treaty for Canadian-born Native Americans (published in 1996).